In Work and the Evolving Self, Steven Axelrod begins to remedy this serious oversight by setting forth a comprehensive psychoanalytic perspective on work life. Consonant with his analytic perspective, Axelrod sets out to illuminate the workplace by examining the psychodynamic meaning of work throughout the life cycle. He begins by exploring the various dimensions of work satisfaction from a psychoanalytic perspective and then expands on the relationship between work life and the adult developmental process. This developmental perspective frames Axelrod's central task: an examination of the typical work-related problems encountered in clinical practice, beginning with a psychodynamic definition of a "work disturbance." Moving on to treatment issues, Axelrod elaborates on the manner in which assessment, supportive, and exploratory interventions all enter into the treatment of work disturbances. Axelrod concludes by considering issues of career development that emerge in individual psychotherapy and exploring the psychological implications of dramatic changes now taking place in the workplace. 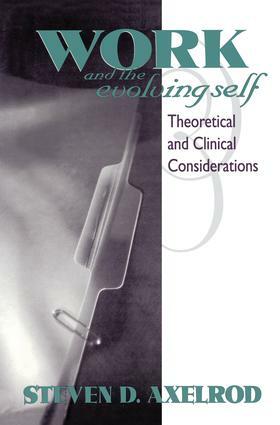 As such, Work and the Evolving Self is an impressive contribution to the task with which psychoanalytic therapists are increasingly engaged: that of broadening their identities and treatment approaches in a world that increasingly demands flexibility and innovation.